I am working at being 100% paperless in my home office. If you remember this post about my zero inbox, you may have already guessed I enjoy zero visual noise. I'm not obsessive about this (am I Beck? ), but I am always trying to find ways to make things easier to find and visually cleaner. It all started with a blog post from Lifehacker.com and has evolved into a really easy and effective system for scanning, filing, and keeping my paperless office. 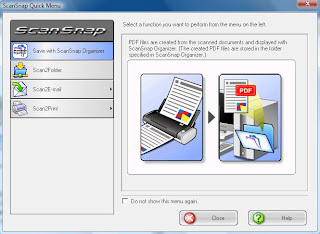 Step one: Get yourself this scanner: It's the ScanSnap S300 from Fujitsu. Not another one, THIS exact model. It does everything it says and it has scanned thousands of pages for me with basically no problems. Step 2. Get yourself another Gmail address. Call it something like [yourname] backups@gmail.com. Step 3. Download Thunderbird or use Outlook and connect it to your current Gmail account, NOT your new one. Enable IMAP. Step 4. Get a shredder. - Open notepad and grab your pile of paperwork. - Enter the name of each document and any details you would like to be able to search for in the future. - Each day, week or month grab all your papers to be filed and scan every single document into one huge file, don't worry about the size - I've done over 100 pages on one document. Now, you may be thinking that you should scan every document separately - but there's really no reason to. If you need to access that Verizon bill in 3 months, who cares if it's scanned right behind your 2009 tax notice or your car payment? - Select Scan To Email. - Email the file to your new GMail backup account and paste the text from the notepad into the body of the email. - I have a filter set up in GMail to automatically delete any messages sent from my main account to my backups account. Otherwise all your backup files will be jamming up your main GMail account. The benefits of using GMail are obvious, the search feature is well... google, there is more than 5 gig of free storage with every account, and it's accessible from anywhere you have an Internet connection. Like this setup or have ideas you want to share? Leave me some comment love.